Hey everybody! I hope you all have had a good week - mine has been very busy, but I managed to make time to do this fun sketch challenge! Our Blogger's Challenge mom, Lisa Somerville, gave us all this sketch to work from. We could create any card with it and I even went a step further and turned the sketch on it's side for my card. I started with a Scallop Circle cut with my Big Shot Scallop Circles #2 die in Whisper White. I sponged the edges with Riding Hood Red and stamped the multi-heart image from the Love You Much stamp set in Basic Brown all over it. I colored in the large hearts with the Blender Pen and Riding Hood Red ink then stamped the images again in Riding Hood Red on Pink Pirouette. I used the Heart to Heart punch to punch them out and layered the medium and small ones over the brown stamped images on the card. Then I added a bit of 2-way Glue and sprinkled on some Dazzling Diamonds Glitter for some bling. The card base is a 6 x 6 square of Close to Cocoa cardstock folded to make a 3" x 6" card. This size fits great in the Small Open End Envelopes. I then used my Jumbo Whimsy Wheel across the bottom of the card front in Chocolate Chip ink to create the fun background. To add the ribbon accent, I used my Horizontal Slot punch and punched a small slit in the top fold of the card, allowing the ribbon to slide through and adhere underneath the birds in the frame. I used the Riding Hood Red Striped Grosgrain for that. My little birds are also from the Love You Much stamp set and are stamped in Basic Brown then watercolored in with Blender Pens and Pink Pirouettte and Riding Hood Red inks. I attached the image to the back of a piece of Silver Hodgepodge Hardware with Mini Glue Dots. This was then adhered to a piece of Pink Pirouette cardstock punched out with the Curly Label punch. This whole embellishment covers the seam in the ribbon so the ribbon looks finished on the inside of the card. I hope you enjoy looking at my creation as much as I enjoyed making it! I think it's very fun - I can't wait to give it away for Valentine's Day! Be sure to check out all the other Blogger's Challenge players by clicking on the link in my sidebar. You are sure to be inspired! Don't forget, you can purchase all the products I used to create this card by shopping on my website 24/7 at www.robinstamps4u.stampinup.net Just click the Shop Now button at the top right corner! Now, while supplies last, Stampin' Up! is giving a FREE Idea Book for all online orders placed through my website. AND Sale-A-Bration is here! With every $50 order, you receive a FREE stamp set, designer series paper or Ribbon Bundle from the LIMITED EDITION Sale-A-Bration brochure! Don't miss these great specials! So cute! I love the little birds peeking from the frame. Can't wait for the birds to arrive in MN....that will mean Spring is on it's way. Oh my gawd!!! How cute is this?!? I love what you did here. the hardware is great, and I love that you used the valentines set. I'm a bit burnt out on it, but maybe i need to take it out for another test drive. Great Job Girlfrind! Love the sketch turned and the label punch behind your HPH, very cute! Love the flip and the way you used the Hodge Podge with the Curly label punch!!! Super cute! Wow Robin...I absolutely love how you framed your little love birds. Genius! You turned the sketch and wow! Love what you created. Love the way you flipped the sketch! And like the little birds peeking out of the hardware. This is adorable, Robin! Love how you framed the bird image with the hardware. How cute is this! Just adorable and fun. Love the long card and the turned sketch and those sweet birds paired with all the pretty hearts just makes this such a great card. 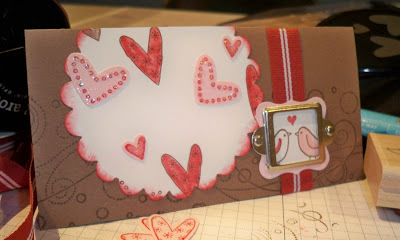 Love the directional flow of your card..All the little hearts really added accents to the whole theme. Very cute! Love the twinkling hearts and the hardware! Just SOUP-AH!! How cute is this?!! Love the wheel background....oh!just everything!! Your card it so cute!!! Love how you turned the sketch!! Great job!! So cute Robin. I love how you rotated the sketch. Very cute Robin! I love the hardware with the punched background! GReat card! Oops, forgot to sign in...sorry! Great card! I love the hardware on with the punched background! Super cute! Too cute! Love the birds in the hardware!